I love the tangy, complex taste of cultured butter, but I rarely buy it since it is pretty expensive. 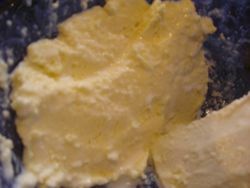 It's pretty easy to make regular butter (just overwhip some cream) but that seemed too easy. 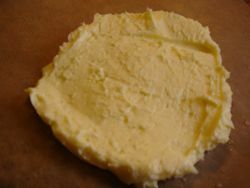 When I started researching how to make cultured butter, I realized that the technique for culturing it is the same as for making homemade creme fraiche. (another expensive product that's much more economical homemade) Since I'd just made homemade creme fraiche (pictured above with Sourdough-Buckwheat Pancakes with Caramelized Apples) I thought I'd try making butter out of some of the creme fraiche. It worked out better than I could have dreamed. Too bad we had already eaten our pancakes with regular store-bought butter before I got around to it. 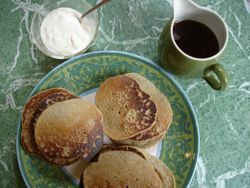 Yes, we put butter and creme fraiche on our pancakes. Something wrong with that? Begin beating it with a hand mixer at medium low speed. Turn it up as it begins to reach whipped cream consistency. 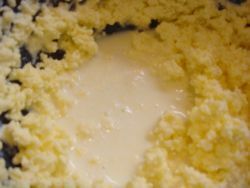 When it goes beyond cream and starts to look more yellow and curdled, you'll want to turn it down again because you don't want to splatter buttermilk all over. It took me about 8 minutes to get to this point. When the buttermilk separates as much as it seems like it will, pour it off and save it. 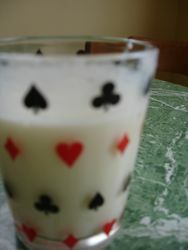 Trust me it's delicious and I never understood why people drank buttermilk until today. 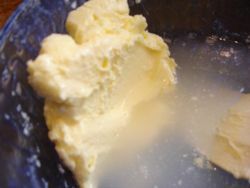 Push the butter into the sides of the bowl with a spatula to get as much buttermilk out as possible. Once all the buttermilk is drained off, add cold water and work it around and through the butter with a spatula. If you skip this step your butter is likely to sour quickly. Do this about three times until the water is fairly clear. Drain off the water and transfer the butter to a piece of parchment. This is where you work in your salt (if wanted) or any other flavorings. I made a small amount of lavender butter out of some of it. I'm thinking biscuits with honey! Chill your buttermilk and enjoy! It's good for you! My dad would be proud. This entry was posted in DIY, Science, pantry staples. Bookmark the permalink. Post a comment or leave a trackback: Trackback URL. 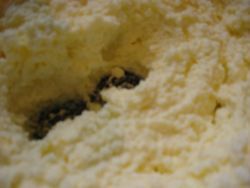 I had the most delicious cultured butter in Romania of all places last year. I’m not sure where to find it here so I think I might give the homemade kind a go.